In a post-Post world, is the Letter dead? The number of letters sent each year is in decline, and when it comes to writing personal letters, some would say terminal decline. 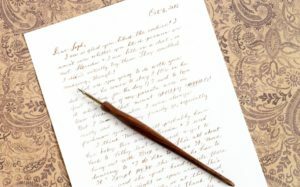 When did you last write to a relative or close friend? So, based on that, would it be fair to say that the letter format as a sales tool is in decline too? And now with the almost ubiquitous rise of social media communications, it seems that the notion of a ‘letter’ might have lost its currency completely. It may be true that we are writing fewer letters – but the format still packs a punch! Research shows that it’s the well-written sales letter – not the outer envelope, the brochure, or even the reply form – that can be the most important part of your direct-mail package. A letter still carries authority. It feels like it has more gravity than mere marketing copy, and reminds us of other more serious situations. Letters are serious. Letters are personal. Letters are literally addressed to us. Even though we know they are most likely automatically produced, we still feel properly addressed. And that still means something. Letters have a solid structure. They have a beginning, middle and end. They allow sub-headlines, you can signpost them to different sectors, and people are happy to dip into them as their interest is piqued. They naturally lead to a strong call to action. This means as well as get interest, a letter can demand action. It comes naturally and logically, not always that easy in other long copy. Letters are still viewed as ‘real’ whereas leaflets and brochures are mere ‘advertising’ – and ‘real’ works!